Description: This is an assortment of 4 different individually packaged Original Little People construction vehicle sets that were sold to retail stores for resale. Each set includes a small construction vehicle that has "spring-loaded" action. The fork lift has a movable fork, the front loaded has a movable bucket, the bulldozer has a push-down plow, and the dump truck has a tilting dump bed. Each set includes a tireless Little People construction worker figure with a crome-like construction helmet. The #343 Fork Lift is the only one of the four sets that was sold with more than 2 pieces (vehicle and construction worker). The #343 Fork Lift was also sold with a small square pallet and a crate. 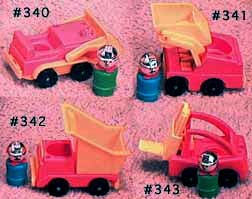 In addition, the other vehicles sold in the #398 assortment were carried on in 1985's #2352 Little People Construction Set, but the fork lift was never used again in the Original Little People line after 1984. The other vehicles were never used again in the Original Little People line after 1985, when the #2352 was discontinued. Each set in this assortment was sold in a 5" x 2-11/16" x 6-7/16" display box. This was replaced in 1985 with #2352 Little People Construction set.